One of the pieces of technology that our Milton dental office has invested in, is a soft tissue laser. With lasers, dentists like Dr. Sarna can provide gentler, less-invasive treatments and significantly reduce the recovery time afterward. Compared to more traditional surgery options, a soft tissue laser is easier on everyone! Uneven gums can make your teeth look lopsided or disproportionate, even if they really aren’t. By adjusting the margins of your gums, we can reveal more tooth structure so that your smile looks fuller and appropriately shaped. If your smile looks “gummy” or your teeth short, gum recontouring is a great treatment to consider. Instead of an invasive procedure and lengthy recovery, you can enjoy a better looking smile with minimal discomfort. The entire process can be completed in just one appointment. When your tooth needs to be restored with a crown, there needs to be enough structure visible above the gums to attach the crown onto. But if wear or damage has limited how much tooth there is to work with, we can remove a small amount of gums around it, lengthening the clinical crown and making restoration possible. This process prevents our Milton dentist from having to extract the tooth. The strip of tissue under the tip of our tongues is called a frenulum. Sometimes, babies are born with a tight frenulum that makes it difficult to nurse or bottle feed. It can even cause the tongue to cleft, or lead to speech issues later on in life. A soft tissue laser is a fast and safe way for us to help babies with tongue ties, so that they can eat efficiently. If your pediatrician suggests having laser surgery, you’ll be relieved to know that it only takes a few minutes to complete. We are happy to offer consultations to parents with young children, if you suspect that this may be something that your child needs to have performed. Sometimes our body can develop excessive or fibrous gum tissues throughout our mouth. It’s often associated with specific types of medications, pregnancy, trauma, or even orthodontic treatment. Once they grow, they don’t usually go away on their own. Rather than remove the tissue surgically, a soft tissue laser allows Dr. Sarna to comfortably smooth the area under local anesthesia. You’ll heal much faster as well. Hawthorne Village Dental Care has other types of dental lasers that can be used for treating tooth decay. While it’s slightly different treating hard tooth structure than soft tissues, the two types of dental lasers still have a lot of similarities. The type we use for fillings allows us to prepare your tooth and remove decay without using conventional drilling methods. 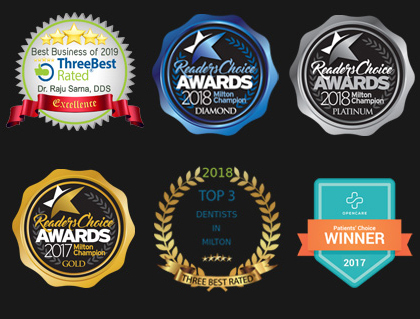 Experience modern Milton dentistry at its finest. Contact Hawthorne Village Dental Care to book a visit with Dr. Sarna and find out how our laser dentistry treatments can change the way you feel about your smile!